Hamha, readers! I know this comic is a little early but I just couldn’t wait for Sunday this time. It took me years of mulling it over, but I finally figured out the direction I want to take this comic: As of today, Curtailed is now No-Tailed! A new sitcom strip about fat hamsters! No worries, you’ll still get to see your two favorite hamigos in action, Fox and I aren’t going anywhere! It’ll take me some time to get the whole look and feel of the site and the strip transferred over, but I’m really pleased with the new artistic direction so far. I think you’re in for two giant cheek-pouches full of laughs watching us fuss over substrate choices and manage our mealworm farm! I’m super excited and I hope you all are too! Bye-Q! On another note: I’ve recently rejiggered my home network to support ipv6, and thus, noticed that your site is not ipv6-reachable, but I thought your hosting provider offered free ipv6. Maybe I am misinformed about that, or maybe the issue is just that you don’t have a AAAA record for your domain? Should we send jars of “YAY! NACHO DIP!” to the usual address? And IPV6 will be important eventually, but not for a while – we hope… Then again, when each lightbulb in the house wants it’s own IP Address so you can turn the lights blue from work, is IPV12 or IPV16 really that far off? IPv4 addresses ran out in North America more than a year ago. Asia ran out many years ago. The industry is already running on fumes, and NAT (*shudder*) is going to be the solution we wind up with if IPv6 doesn’t complete its deployment very soon. Besides, core routing tables have gotten out of control due to all the crazy measures that now must be taken to squeeze out every last address. Regarding light bulbs, since a delegated /64 to each consumer is the standard recommendation, you will already have enough address space for more light bulbs than can possibly be manufactured by the whole world ever, let alone fit in your house. IPv6 was designed with exactly the kind of silliness you’re talking about in mind already. So what will you do next year when April 1st is on Sunday? The same thing we do every Sunday, Pinky. I use that response every time I get a “what are you doing next ‘foo’?” type question, mostly because I don’t have any near as interesting life as you two. In my opinion, it’s just an excuse for liars to get away with being lying liars. Particularly with web comics, I would be happier if it was limited to the actual day, but with different time zones and the fact that may webcomic artists only put a comic up a week, it turns into April fools WEEK. 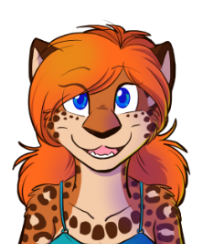 Of course, it could be that I’m just an honest person who takes things at face value (because the alternative would be to act completely paranoid about everything) and lacks the ability to pull any April fools stuff myself. it’s just an excuse for liars to get away with being lying liars. “Merbey…” Reminds me of Garfield’s response when asked of the whereabouts of Jon’s candy caramels: “Mon’t mook at meef”. For a split second I was fooled, partially because I was looking at this on April 2nd. XD Good one! I think the hamster-yous are adorable! 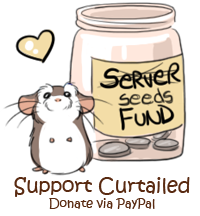 I just realized the hamster on the donate thing. (very technical term, I know) It was foretold but nobody believed it! No-tails reminds me of The League of Gentlemen which is a really dark English comedy series that I would thoroughly recommend. That meant I got double chuckles this week! It appears that the button has been cheating on me too. I discovered it in a sordid affair with the “inside a box” strip. Do Clocky and Disco still exist? I realized while rereading older strips (I got bored) that the screaming clock and the zombie child haven’t appeared in a long while. IIRC Clocky jumped off of one ledge too far and has since gone to the big end-table in the sky. Disco still exists, but the house has been a construction zone so long he doesn’t get to run as much. He also hasn’t done anything particularly funny in a long while. That’s the problem with gadgets these days–no creativity. They’re like robots!